Movies at the Port Isabel Lighthouse! Season 11 starts on Friday, June 5th at 9:30 p.m.! Movie nights will be every Friday in June & July at 9:30 p.m. Since 2005, the LHEC has offered movies projected on the side of the Lighthouse during the summer months and the weekend of Halloween and Day of the Dead and other selected dates. Using the lighthouse as a movie screen helps to create a family friendly evening of fun and memories! Concessions are available and there is no charge to view the movie. Since 2008, those interested have been able to participate in the movie selection process with our annual movie survey. Thanks to sponsors, the Museums of Port Isabel, Port Isabel Economic Development Corporation and the City of Port Isabel, these events are free to the public. Thousands have enjoyed this unique experience and many have made it a family tradition! Bookmark this site for our schedule or email info@portisabel-texas.com to be added to our newsletter. 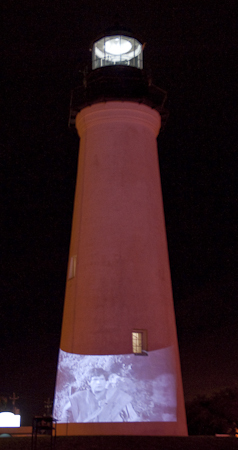 Showing of a movie on the side of the lighthouse during the Museums of Port Isabel’s Day of the Dead Celebration.